Tank Man (also known as the Unknown Protester or Unknown Rebel) is the nickname of an unidentified Chinese man who stood in front of a convoy of incoming tanks on June 5, 1989, the morning after the Chinese military had suppressed the Tiananmen Square protests of 1989 by force. As the lead tank maneuvered to pass by the man, he repeatedly shifted his position in order to obstruct the tank's attempted path around him. The incident was filmed and smuggled out to a worldwide audience. Internationally, it is considered one of the most iconic images of all time. Inside China, the image and the events leading up are subject to heavy state censorship, and as a result they are being forgotten. "Tank Man" temporarily stops the advance of a column of tanks on June 5, 1989, in Beijing. This photograph (one of four similar versions) was taken by Jeff Widener of the Associated Press. There is no reliable information about the identity or fate of the man; the story of what happened to the tank crew is also unknown. At least one witness has stated that "Tank Man" was not the only person who had opposed the tanks during the protest. Shao Jiang, who was a student leader, said: "I witnessed a lot of the people standing up, blocking the tanks." Tank Man is unique in that he is the only one who was photographed and recorded on video. The incident took place at the north edge of Tiananmen Square, along Chang'an Avenue, on June 5, 1989, one day after the Chinese government's violent crackdown on the Tiananmen protests. The man stood in the middle of the wide avenue, directly in the path of a column of approaching Type 59 tanks. Stuart Franklin, who was on assignment for TIME magazine, told the New York Times, "At some point, shots were fired and the tanks carried on down the road toward us, leaving Tiananmen Square behind, until blocked by a lone protester." He wore a white shirt and black trousers, and he held two shopping bags. As the tanks came to a stop, the man gestured towards the tanks with one of the bags. In response, the lead tank attempted to drive around the man, but the man repeatedly stepped into the path of the tank in a show of nonviolent action. After repeatedly attempting to go around rather than crush the man, the lead tank stopped its engines, and the armored vehicles behind it seemed to follow suit. There was a short pause with the man and the tanks having reached a quiet, still impasse. Having successfully brought the column to a halt, the man climbed onto the hull of the buttoned-up lead tank and, after briefly stopping at the driver's hatch, appeared in video footage of the incident to call into various ports in the tank's turret. He then climbed atop the turret and seemed to have a short conversation with a crew member at the gunner's hatch. After ending the conversation, the man descended from the tank. The tank commander briefly emerged from his hatch, and the tanks restarted their engines, ready to continue on. At that point, the man, who was still standing within a meter or two from the side of the lead tank, leapt in front of the vehicle once again and quickly re-established the man–tank standoff. Video footage shows two figures in blue pulling the man away and disappearing with him into a nearby crowd; the tanks continued on their way. Eyewitnesses are unsure who pulled him aside. Charlie Cole, who was there for Newsweek, said it was the Chinese government PSB (the police), while Jan Wong, who was there for The Globe and Mail, thought that the men who pulled him away were concerned bystanders. In April 1998, Time included the "Unknown Rebel" in a feature titled "Time 100: The Most Important People of the Century". In November 2016, Time included Jeff Widener's photograph in "Time 100: The Most Influential Images of All Time". Little is publicly known of the man's identity or that of the commander of the lead tank. Shortly after the incident, the British tabloid Sunday Express named him as Wang Weilin (王维林), a 19-year-old student who was later charged with "political hooliganism" and "attempting to subvert members of the People's Liberation Army." However, this claim has been rejected by internal Communist Party of China documents, which reported that they could not find the man, according to the Hong Kong-based Information Center for Human Rights. One party member was quoted as saying, "We can't find him. We got his name from journalists. We have checked through computers but can't find him among the dead or among those in prison." Numerous theories have sprung up as to the man's identity and current whereabouts. There are several conflicting stories about what happened to him after the demonstration. In a speech to the President's Club in 1999, Bruce Herschensohn, former deputy special assistant to President Richard Nixon, reported that he was executed 14 days later; other sources say he was executed by firing squad a few months after the Tiananmen Square protests. In Red China Blues: My Long March from Mao to Now, Jan Wong writes that she believes from her interactions with the government press that they have "no idea who he was either" and that he is still alive somewhere on the mainland. Another theory is that he escaped to Taiwan and remains employed there as an archaeologist in the National Palace Museum. This was first reported by the Yonhap news agency in South Korea. The government of the People's Republic of China has made few statements about the incident or the people involved. In a 1990 interview with Barbara Walters, then-CPC General Secretary Jiang Zemin was asked what became of the man. Jiang first stated (through an interpreter), "I can't confirm whether this young man you mentioned was arrested or not," and then replied in English, "I think never killed" [sic]. The government also argued that the incident evidenced the "humanity" of the country's military. In a 2000 interview with Mike Wallace, Jiang Zemin said, "He was never arrested." He then stated, "I don't know where he is now." He also emphasized that the tank stopped and did not run the young man down. Internationally, the image of the lone man in front of the tank has come to symbolize the events at Tiananmen Square in 1989 and is widely considered one of the most iconic images of all time. A PBS interview of six experts noted that the memory of the Tiananmen Square protests appears to have faded in China, especially among younger Chinese people, due to government censorship. Images of the protest on the Internet have been censored in China. When undergraduate students at Peking University, which was at the center of the incident, were shown copies of the iconic photograph 16 years afterwards, they were "genuinely mystified." One of the students said that the image was "artwork." It is noted in the documentary Frontline: The Tank Man that he whispered to the student next to him "89," which led the interviewer to surmise that the student may have concealed his knowledge of the event. It has been suggested that the "Unknown Rebel," if still alive, never made himself known as he is unaware of his international recognition due to Chinese media suppression of events relating to government protest. At and after the events in the square, the PSB treated members of the international press roughly, confiscating and destroying all the film they could find, and forced the signing of confessions to offences such as photography during martial law, punishable by long imprisonment. Five photographers (one of whom did not share his material for 20 years) managed to capture the event on film that was not later confiscated by the PSB. On June 4, 2009, the fifth photographer released an image of the scene taken from ground level. The widest coverage of the event and one of the best-known photographs of the event appearing in both Time and Life magazines, was documented by Stuart Franklin. He was on the same balcony as Charlie Cole, and his roll of film was smuggled out of the country by a French student, concealed in a box of tea. The most-used photograph of the event was taken by Jeff Widener of the Associated Press, from a sixth-floor balcony of the Beijing Hotel, about half a mile (800 meters) away from the scene. Widener was injured and suffering from the flu. The image was taken using a Nikon FE2 camera through a Nikkor 400mm 5.6 ED-IF lens and TC-301 teleconverter. With Widener running out of film, a friend (by the name of Kirk) hastily obtained a roll of Fuji 100 ASA color negative film, allowing him to make the shot. Though he was concerned that his shots were no good, his image was syndicated to many newspapers around the world and was said to have appeared on the front page of all European papers. He was also nominated for the Pulitzer prize but did not win. Nevertheless, his photograph has widely been known as one of the most iconic photographs of all time. 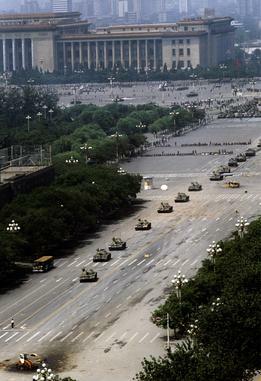 Wider shot by Stuart Franklin showing column of tanks approaching Tank Man, who is shown near the lower-left corner. Charlie Cole, working for Newsweek and on the same balcony as Stuart Franklin, hid his roll of film containing Tank Man in a Beijing Hotel toilet, sacrificing an unused roll of film and undeveloped images of wounded protesters after the PSB raided his room, destroyed the two aforementioned rolls of film and forced him to sign a confession to photography during martial law, an imprisonable offence. Cole was able to retrieve the roll and have it sent to Newsweek. He was awarded the 1990 World Press Photo of the Year and the picture was featured in Life's "100 Photographs That Changed the World" in 2003. On June 4, 2009, in connection with the 20th anniversary of the protests, Associated Press reporter, Terril Jones, revealed a photo he had taken showing the Tank Man from ground level, a different angle from all of the other known photos of the Tank Man. Jones wrote that he was not aware of what he had captured until a month later when printing his photos. Arthur Tsang Hin Wah of Reuters took several shots from room 1111 of the Beijing Hotel, but only the shot of Tank Man climbing the tank was chosen. It was not until several hours later that the photo of the man standing in front of the tank was finally chosen. When the staff noticed Widener's work, they re-checked Tsang's negative to see if it was of the same moment as Widener's. On March 20, 2013, in an interview by the Hong Kong Press Photographers Association (HKPPA), Wah told the story and added further detail. He told HKPPA that on the night of June 3, 1989, he was beaten by students while taking photos and was bleeding. A "foreign" photographer accompanying him suddenly said, "I am not gonna die for your country," and left. Wah returned to the hotel. When he decided to go out again, the public security stopped him, so he stayed in his room, stood next to the window and eventually witnessed the Tank Man and took several shots of the event. In addition to the photography, video footage of the scene was recorded and transmitted across the globe. Australian Broadcasting Corporation (ABC) cameraman Willie Phua, CNN cameraman Jonathan Schaer and NBC cameraman Tony Wasserman appear to be the only television cameramen who captured the scene. ABC correspondents Max Uechtritz and Peter Cave were the journalists reporting from the balcony. After seeing Chinese tanks crush vehicles and people on June 3, many journalists and photographers believed the protests had already reached their peak, causing many to leave the area before the "tank man" incident occurred. The Tank Man is the subject of the song "The Tiananmen Man" (1996) by the American heavy metal band Nevermore. In Tom Clancy's 2000 novel The Bear and the Dragon, the Chinese authorities apprehend and execute Tank Man, then bill the surviving family for the cost of the pistol round expended to shoot him in the back of the head. In Family Guy, Tank Man is seen with Peter Griffin in a cutaway segment. A similar scene is depicted in the music video for Club Foot (2004) by the English rock band Kasabian. Tank Man is briefly referenced in the 2007 film Superbad. The music video for "Refuse/Resist" by the thrash/death metal band Sepultura features brief footage of the Tank Man. A fictionalized version of the fates of both the Tank Man and a soldier in the tank is told in Lucy Kirkwood's 2013 play Chimerica, which premiered at the Almeida Theatre from May 20, 2013 to July 6, 2013. The TV miniseries based on the play was first broadcast in April 2019 on Channel 4 in the UK. On June 4, 2013, Sina Weibo, China's most popular microblog, blocked terms whose English translations are "today", "tonight", "June 4", and "big yellow duck". If these were searched for, a message appeared stating that, in accordance with relevant laws, statutes, and policies, the results of the search could not be shown. The censorship occurred because a photoshopped version of Tank Man, in which rubber ducks replaced the tanks, had been circulating around Twitter—a reference to Florentijn Hofman's Rubber Duck sculpture, which at that time was floating in Hong Kong's Victoria Harbour. Footage of Tank Man is included in the 2014 film adaptation of Lowis Lowry's The Giver, during a montage intended to give the protagonist strength. A 2017 novel published by Random House Mondadori, La quimera del Hombre Tanque fictionalizes a second, hypothetical encounter between the two protagonists of the iconic photo of 1989. Aiming at social reconciliation, a group of Chinese leaders tries to broadcast on TV, a quarter of a century after the incident, a peaceful encounter between Tank Man and the tank commander. ^ a b c d e Witty, Patrick (June 3, 2009). "Behind the Scenes: Tank Man of Tiananmen". The New York Times. ^ a b c Corless, Kieron (May 24, 2006). "Time In – Plugged In – Tank Man". Time Out. ^ Jacobs, Harrison (June 4, 2018). "24 photos from the Tiananmen Square protests that China has tried to erase from history". Business Insider. Retrieved March 21, 2019. ^ "Photographer Jeff Widener". BBC interview (Video ed.). 2014. ^ "Shao Jiang interview". Amnesty International (Video posted for 25th anniversary ed.). Retrieved May 28, 2014. Those interviewed include photographer Stuart Franklin with Magnum for TIME, who was on the 5th floor balcony of the Beijing Hotel. ^ Makinen, Julie (June 4, 2014). "Tiananmen Square mystery: Who was 'Tank Man'?". Los Angeles Times. Retrieved April 16, 2015. ^ Langely, Andrew (2009). Tiananmen Square: Massacre Crushes China's Democracy Movement. Compass Point Books. p. 45. ISBN 978-0-7565-4101-9. ^ a b c The Unknown Rebel Time Magazine profile, 13 April 1998. Retrieved 10 August 2014. ^ Picture Power:Tiananmen Standoff BBC News. Last updated October 7, 2005. ^ Iyer, Pico (April 13, 1998). "The Unknown Rebel". Time. Retrieved April 16, 2015. ^ "Time 100: The Most Influential Images of All Time". Time. November 6, 2016. Retrieved May 19, 2017. ^ "Man who defied tanks may be dead", Los Angeles Times, June 3, 1990. ^ Munro, Robin; Spiegel, Mickey (1994). Detained in China and Tibet: a directory of political and religious prisoners. Asia Watch Committee. p. 194. ISBN 978-1-56432-105-3. ^ a b c d e Macartney, Jane (May 30, 2009). "Identity of Tank Man of Tiananmen Square remains a mystery". The Times. London. ^ "Tiananmen Square 25th anniversary: What happened to Tank Man?". The Independent. June 4, 2014. Retrieved December 11, 2017. ^ "Frontline: The Tank Man transcript". Frontline. PBS. April 11, 2006. Retrieved June 30, 2008. ^ Higgins, Andrew (January 20, 2012). "Tycoon prods Taiwan closer to China". The Washington Post. Retrieved January 31, 2012. ^ "China's Leader Talks To 60 Minutes". cbsnews.com. August 31, 2000. ^ a b Witty, Patrick (June 4, 2009). Behind the Scenes: A New Angle on History The New York Times. ^ "Legacy of June Fourth". ^ "The Tank Man: Interview: Jan Wong". Frontline. PBS. April 11, 2006. Retrieved August 12, 2010. ^ a b Picture Power: Tiananmen Standoff. BBC News. October 7, 2005. ^ Alfano, Sean (June 4, 2009). ""Tank Man": The Picture That Almost Wasn't". CBS News. ^ Patrick Witty (June 3, 2009). "Behind the Scenes: Tank Man of Tiananmen". The New York Times. Archived from the original on September 12, 2010. Retrieved September 12, 2010. ^ Jones, Terril (2009). "Tank Man". Pomona College Magazine. 41 (1). Archived from the original on March 6, 2010. ^ a b "Arthur Tsang Hin Wah interview, March 20, 2013". google.com.hk. ^ "Capturing Asia". Books and Essays by Bob Wurth on the Asia Pacific Region. Retrieved June 15, 2015. ^ Willie Phua on Australia Broadcasting Corporation (ABC) 7.30 Report. ABC. November 29, 1996. ^ Lewis, George (June 4, 2009). "Recalling the spirit of Tiananmen". Retrieved November 15, 2016. ^ "Timeline: ABC marks 40 years of reporting from China". ABC News. October 31, 2013. Retrieved June 15, 2015. ^ Photojournalist on Tiananmen Square tank standoff. CNN. May 19, 2001. ^ Kasabian. "Club Foot feat. Dinara Drukarova". Vimeo. ^ Hitchings, Henry (May 29, 2013). "Chimerica, Almeida Theatre – theatre review". London Evening Standard. Retrieved June 16, 2015. ^ Didi Kirsten Tatlow (June 4, 2013). "Censored in China: 'Today,' 'Tonight' and 'Big Yellow Duck'". International New York Times IHT Rendezvous. ^ "Fool's Errand: Why China Censors Rubber Duckies On Tiananmen Anniversary". The Washington Post. June 4, 2013. June Fourth: The True Story, Tian'anmen Papers/Zhongguo Liusi Zhenxiang Volumes 1–2 (Chinese edition), Zhang Liang, ISBN 962-8744-36-4. "Behind the scenes: Tank Man of Tiananmen" (New York Times), with link to video of the incident. The Stuart Franklin photo at Life magazine 100 photos that changed the world. (in Chinese) Professor disclosed heroic Wang Weilin still in world, dajiyuan.com. Retrieved June 1, 2006. PBS Frontline documentary "The Tank Man", 2006, Program viewable online. Last Retrieved July 29, 2008.